While the world focuses on the challenges of debt and macro-economic budgets, food and beverage companies have again become a refuge for investors. - Create brand loyalty through establishing closer links between products, brand activators and consumers to build a virtuous circle of trial, awareness and availability. A downgraded America may face some new issues, but Food and Beverage companies face the same issues they have faced since the last downturn. Now is the time to recognize and act on the opportunity. 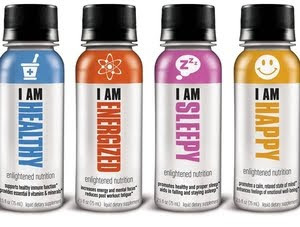 The first was I AM SLEEPY, from the I AM line - taste was tough, but the impact was great. Peaceful sleep from LAX to New York. 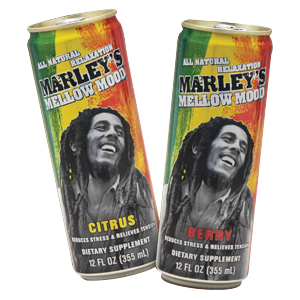 Second was Marley's Mellow Mood - Citrus version - and tasted like a pleasant Lemon Tea. Again, after a long couple of days of travelling the flight to Brussels passed rapidly, peacefully - and with plenty of zzz's. So, the products work. Is there an opportunity? While the Marley idea is very cool, I would be concerned that it is not a refreshment beverage idea. The shot is more convenient, and delivers a functionality in a fun way. I would be concerned that the only relaxation times are in the evening - when the competitive set is alcohol. 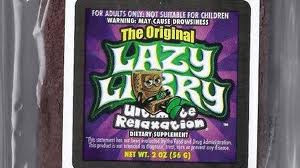 Then there are Lazy Larry's melatonin brownies... These "Amsterdam-inspired" relax with a brownie concept is edgy and cool. But may be at the edge of what is OK. I have recently been using Twitter far more frequently as a way to highlight the mist recent emerging tidbits of information that pique my interest. So, follow my food and beverage thoughts at @foodsfluidsbynd, and my personal comments on life, cricket and any other interesting items at @Justcoz. A lot has been made of the new Kraft "liquid flavoring" product Mio. But in the spirit of what is old is new again, it looks to me that it is just a re-imagining of what is often called a coridal in the USA, and orange squash in England. Their opportunity has been the stick pack powder business that has grown dramatically in recent years. The brand leading that charge has been Kraft's own redoubtable Crystal Light. Now they see the chance to make the er-constitution category more contemporary - and reach a younger consumer. Certainly I applaud their creativity in their "Liquid Water Enhancer", but unless there is a significant taste improvement, it may struggle to sell at the premium price they are asking. People fundamentally buy reconstituted products to save money. This week Ira Glassman's This American Life (I am sourcing their Facebook page because their homepage has been overwhelmed) has an interesting exploration on Coca Cola - and its taste. We all know the story that the Coca Cola recipe is a guarded secret because it cannot be replicated. Well, Ira used a published potential original recipe from the Atlanta Journal Constitution to see if he could replicate it. Ira Glassman had this made up by Jones soda and Sovereign Flavors- only to discover that it is not necessarily about the generic ingredients but the source of the ingredients that can make a difference. And that flavor technology and tastes have come a long way since the 19th century. In my experience a good flavor technologist can replicate the taste of Coke - or Pepsi. The guys at RC used to test my taste buds by presenting store bought Coke vs their lab-made sample. I could not pick the difference - and often preferred their lab sample. Is the above recipe correct? Or an abandoned ancestor? Tough to know. But it also shows that it has become the strength and distribution of the brand that is as or more important as the taste or efficacy off the product. The NBJ has reported that the US government would purchase integrative (ie natural) medicines from the public purse worth $15B over the next 10 years. Frankly, this a stunning number and endorsement for Complementary and Alternative medicine. At the same time, homeopathy has been under fire in the UK. Above is the BBC investigation into homeopathy from Newsnight which paints a very negative picture of the practice. - Posted using BlogPress from my iPhone. Typos courtesy of predictive text. Ok, so the young male consumers of 99c teas may be the right connection, but Chuck Liddell seems an unlikely way to engage the tea consumer, even with the popularity of MMA. Posted using BlogPress from my iPhone. Typos courtesy of predictive text. The joys of a big display. I have been in Florida for the weekend, and visited a few Supermarkets. Being January they are dominated by the merchandising of beverages, snacks and beer to get people in the mood for the superbowl. Some were big vertically, some horizontally- but my favorite was the fake truck bed from a Publix in Fort Myers. As a tween, my family moved from Sheffield in the Northeast of England to the Northwest: To be precise St Helens. Actually a city of around 200,000 it was a similar industrial center - we swapped a decaying steel-making city for a decaying glass-making town. But the change of locales included a change of available foods and drinks - and my first encounter with Vimto. Most Brits can identify Ribena - the GSK blackcurrant drink. But there are a select few that really know Vimto. I can remember the first time I saw it - and had no idea what it was - at a small independent grocery. I bought it and enjoyed for the first the time the sweet, yet complex purple fluid. It is not as sweet or simple on the palate as Ribena, it is a mix of spices and juices that remains unique. After a quick check Vimto on Wikipedia, I note that the canned version I used to buy was carbonated (I remember it was still) and it can be a cordial too (vaguely remember that as well). 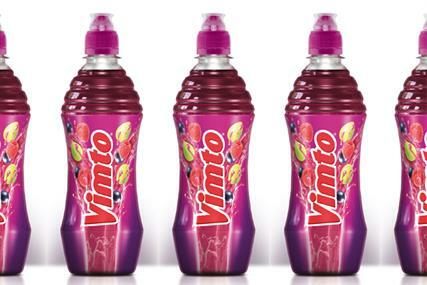 But mostly I remember Vimto as a new, underground discovery (since it was created in 1908 - I was wrong). I decided to start a tweet stream of the interesting food and beverage stuff that I come across... Follow me at http://twitter.com/foodsfluidsbynd . I will continue to do my personal tweeting (hope you like cricket and music) at http://www.twitter.com/justcoz.